Callot Model of Blue Crepe Chinois. Paris Spring Season 1913. Home » Callot Model of Blue Crepe Chinois. Paris Spring Season 1913. Callot Model of Blue Crepe Chinois. Paris Spring Season 1913. Afternoon Gown, Callot Blue Crepe Chinois, Satin underskirt to match with a deep fold of material draped over skirt held up with black silk tassels. Vest and under cuffs of cream net top lace. Black Satin belt and bow and white buckle. White Satin, Vest and front of skirt with buttons and buttonholes. White crochet buttons dotted to match material. 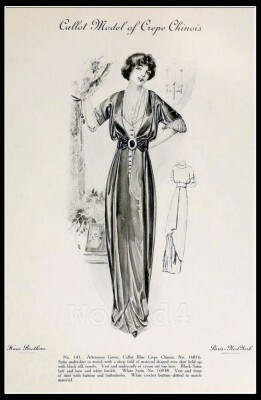 Cocktail dress by couturier Callot Soeurs. Published by Haas brothers. 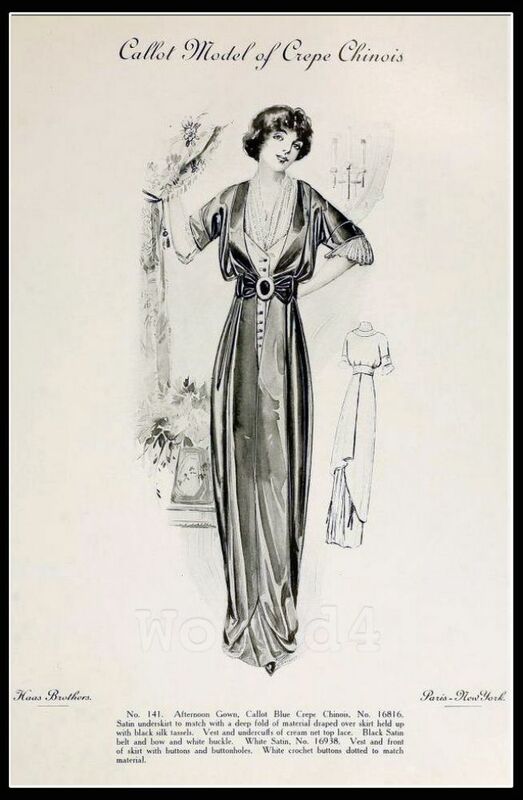 This entry was posted in 10s, 1913, 20th Century, Fin de siècle, France and tagged Belle Epoque Fashion, Callot Soeurs, Couturier, Haute Couture Costumes on 8/8/13 by world4.